I’ve been an off-and-on baker of bread ever since I spent a summer living and working at a Christian community in Dorset in my late teens. The baking of bread there was driven by a need for economy, and a belief that simple food made from basic ingredients was just better in almost every way. My views on religious faith may have changed, but that still pretty much sums up my approach to food. At university I continued to bake, and then had a job with the British Antarctic Survey. On an Antarctic base all the bread had to be baked there. The cook did the bulk of it but on his day off we would take it in turns to cook and bake. I continued to make my own bread whenever my situation would allow and some 30 years later I’m still at it. On ‘retiring’ from a regular job I finally found the time to experiment with something I’d always wanted to try. Sourdough. I’d first come across the idea in Antarctica: the base had a subscription to National Geographic magazine and some archaeologists had been re-discovering how to make the bread they saw depicted in Egyptian tomb drawings. They found that the natural yeasts on the grain would start the bread fermenting without the addition of yeast. Another article I found described the way that pioneers in the USA and Canada were called ‘Sourdoughs’ because of the way they kept a batch of flour fermenting so that they could make their bread. I’d picked up an old book in Mr Books, the second-hand bookshop in Tonbridge, called “We Live in Alaska” about a young couple who, in 1941, took a canoe trip of the state in which they had just moved to live. It mentioned how the settlers could make pretty much any bread from the pail of fermenting sourdough in the corner of their cabin kitchen. 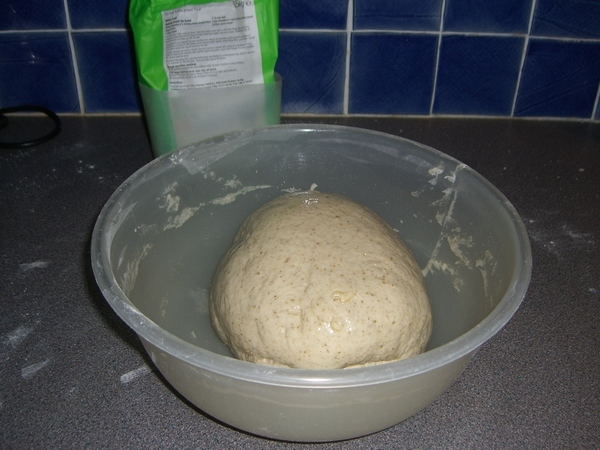 Finally, some time in 2008 I stumbled on a web page by S John Ross describing how to make a starter and bake a basic loaf. (The page has moved since I first found it but it’s currently here.) It included the line “If this sounds brain-dead simple, that’s because it is. People who didn’t believe the Earth was round did this for millenia.” I felt I could handle that. When most people try my everyday bread they are surprised that it is sourdough. It doesn’t taste sour for a start. I can use my starter to make everything from ciabatta to crumpets. I can make a sour tasting loaf. I can make one that is full of big holes, with a tough chewy crust, and I am a fan of that style of bread too. 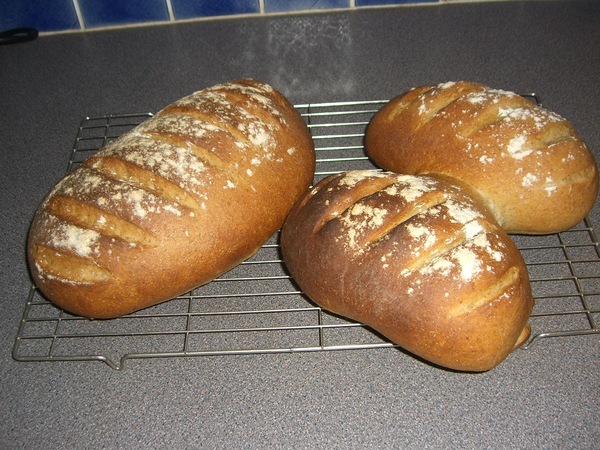 But for everyday use I just wanted a white or wholemeal loaf that went well with soup and could be used to make a sandwich. It turns out that proper bread is like proper beer: there are only a few basic ingredients, yet the variety that can be achieved is amazing. My starter lives in the fridge in a preserving jar with the rubber seal removed. (This thing is fermenting, and I don’t want a glass bomb going off in my kitchen!) 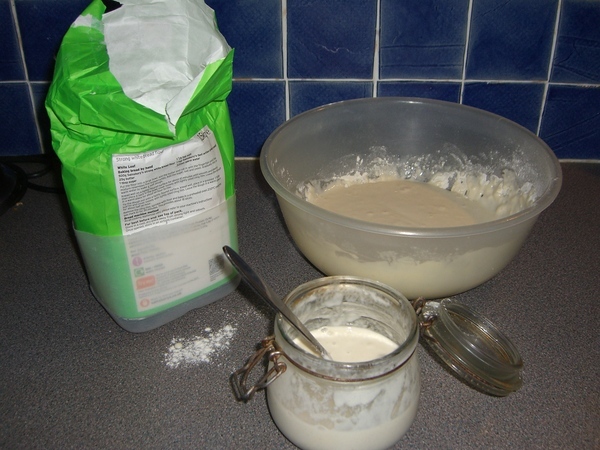 It gets a bit gelatinous so I mix it all up with a fork to get it moving, put more flour and water into a bowl and beat the lot together. This is technically called a ‘sponge’ and it sits overnight, covered in film in the oven with just the interior light on. 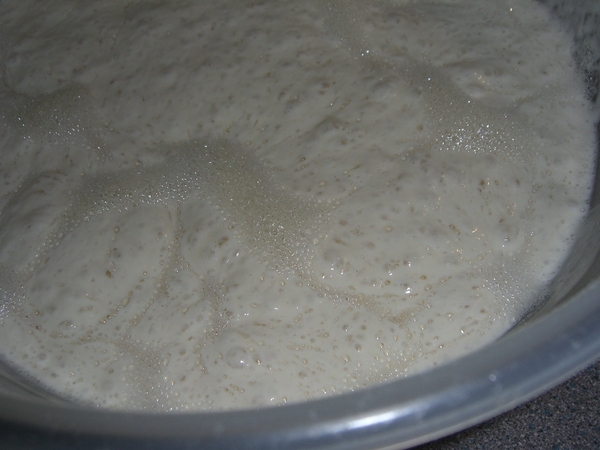 In the morning you can see the bubbles all over it where it is fermenting. I mix it up, take out half a cup and put it back in the washed jar, along with more flour and water to feed it, and it goes back in the fridge. It’s fine there without any other attention for up to two weeks. I add flour (a mixture of white wheat and wholegrain rye today) salt and a little olive oil to the remaining sponge to make a dough. I knead it for five minutes. 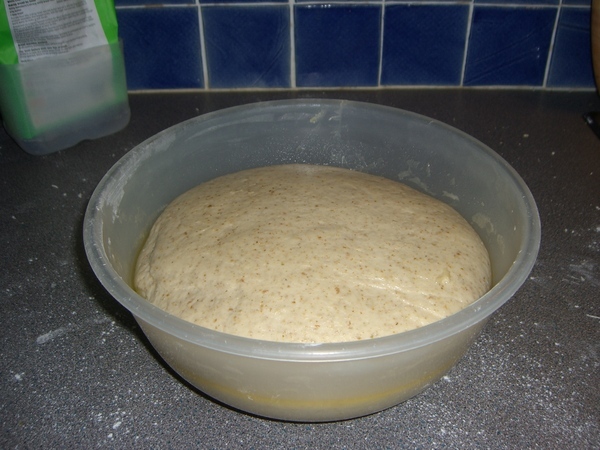 I oil the bowl and roll the dough round in it to coat the surface a little, which stops a crust forming. That gets covered with the same piece of film and goes back in the oven with the light on to prove for two hours or so. It generally doubles in size. Now I make it into loaves. Usually I make one from half the batch and then two smaller ones from the other half. The smaller ones are a good size to fit in our freezer. 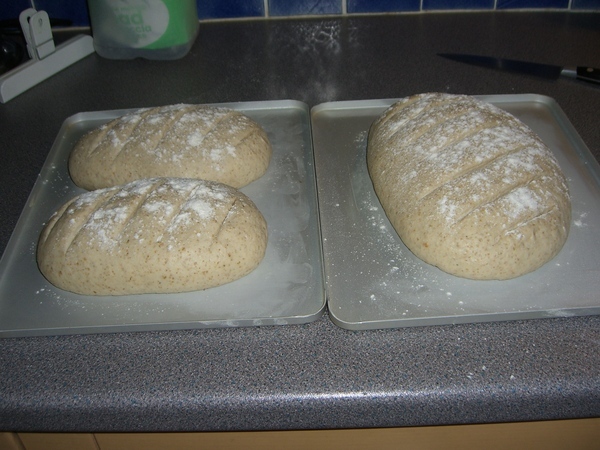 The loaves go back in the oven out of the way, again unheated, to prove for another hour. I then slash the tops and dust them with flour. I turn the oven on and I don’t wait for it to reach temperature, I just put the bread in. Modern ovens get up to heat pretty fast anyway and it gives the yeast a last chance to produce bubbles. A key thing for the development of a good crust is a moist atmosphere in the oven. There are various ways of achieving this. I just open the door every so often and spray with a garden mister. That’s it: bread done, house smelling wonderful, just time to make a wholesome soup for lunch with whatever I can find in the fridge/veg bin whilst the bread cools on a wire rack. It is tempting to dig in right away, but it really is better when it has cooled to barely warm. It’s a long process, which is good: that’s what makes it taste better than commercial bread. But how much of my time and effort has this taken? Not much really when you look at it. Five minutes the night before. About 15 minutes to make the dough. Ten minutes to form loaves and tidy up. A few minutes during baking to adjust the temperature and spray the oven. I set a timer to remind me when to spray and get on with something like catching up with emails, reading the news and other people’s blogs. Confession: no healthy soup today. We decided to make it into bacon sandwiches instead! 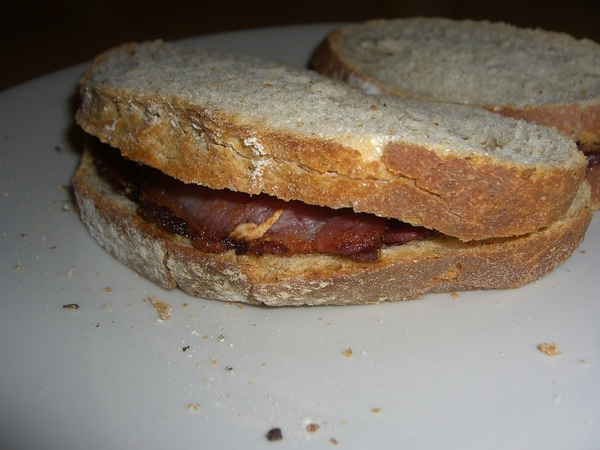 I’ve never made bread, but any effort is justified by a good bacon sandwich in the end!